ColRebSez: Seventy bucks and 90 minutes results in some pretty nifty under-counter lights. From Oxford, Mississippi, News and views on state and local happenings and politics, along with various items on travel, dining and random national and world observations. Your blog editor is Frank Hurdle. I'm a native of Holly Springs, Mississippi; and a graduate of Ole Miss, B.A. and J.D. I buy and sell rural land and practice law. My philosophy of life is simple: When society or the free market rewards an activity -- monetarily or through approbation -- then society will get more of that activity. Punish an activity -- through taxation or otherwise -- and you will get less of it. Unfortunately, the geniuses who run this fine country of ours haven't figured this out yet. Seventy bucks and 90 minutes results in some pretty nifty under-counter lights. Lights off except for microwave, which is weak. Note that it is daytime, so plenty of natural light. It's darker at night. I'm not Mr. Handy when it comes to home improvements, but I just invested 90 minutes to install some pretty nifty under-counter lighting in a house I've been fixing up. I had some contractors doing some work on the kitchen, and the Sheet rock was off the walls, so having properly wired under-counter lighting would have been easy. 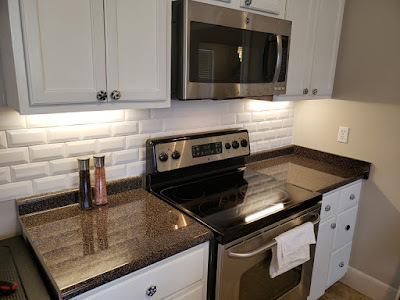 But it still would have taken several hours to do the wiring, expenses were piling up, and I decided the kitchen was bright enough, and that the light underneath the microwave, along with 300 watts in the ceiling and a bright LED over the kitchen sink was enough. And indeed all of that lighting was enough; except it wasn't. I really like under-counter lighting and just wanted more light. I was fortunate that we installed an electrical outlet in the cabinet over the stove to plug in the microwave; this provided a power source. For my actual lights I purchased two Commercial Electric brand LED under cabinet lights. These lights come with a detachable plug and are linkable. A small linking cord is provided, but it's possible to buy longer linking cords. 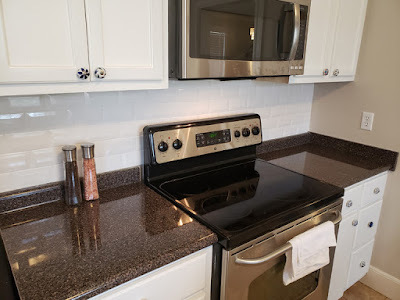 I didn't want a linking cord running underneath the microwave as it might be visible and I didn't like the idea of an electrical cord running over the stove. So I ran cords up the back of each cabinet from each light up to the outlet over the microwave and plugged them into a very small power strip. Since the cord was detachable I was able to drill a fairly small hole in the cabinets using a 5/8" spade bit. The lights are held in place by little plastic brackets. Installation was easy; I spent almost an hour putting in the first light because I had to think about things, but the second one was installed the next day in less than 20 minutes, and that includes the time to drill the holes. The lights have a “high” and “low” setting and can be switched on and off by the switch on each light. I've ordered a wireless “light” switch that I can stick on the wall that will turn the power on and off at the outlet. It hasn't arrived yet, but when it does the lights will work just like hard-wired lights. They have a color temperature of 3,000, which is slightly starker than "warm white," but still easy on the eye with no blue tint found in "daylight" bulbs. I'm pretty pleased with how it turned out, although I'm shopping for some brighter lights for the microwave. As for cost, the lights were $23 each; the mini power strip was something like $8. 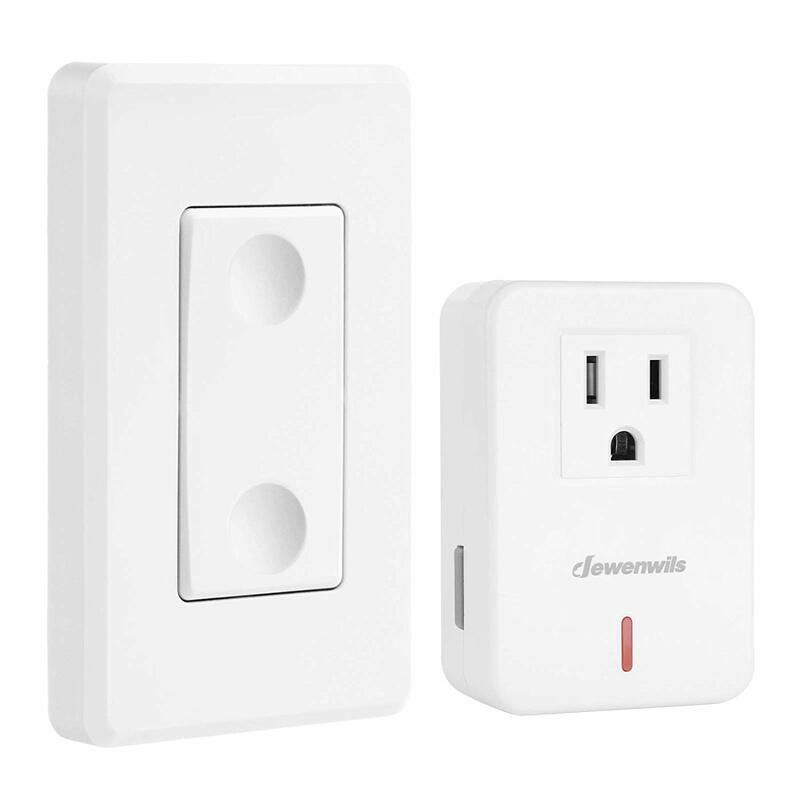 The wireless wall switch cost $19, for a total project cost of less than $70 after tax. Wildlife, Fisheries & Parks Dept.